At home he is energetic, playful, overwhelmingly affectionate and highly active. He can be difficult if not properly trained. From the time he is a puppy until old age, he will require a great deal of attention and exercise. Outgoing and friendly, the Parson is tenacious in the field and affectionate in the home. 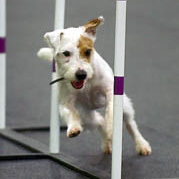 No matter the venue, the breed is filled with energy, so he requires regular exercise and attention. Although good with children, he does not tolerate rough handling from toddlers. The PRTAA celebrates the accomplishments of our dogs and our members. 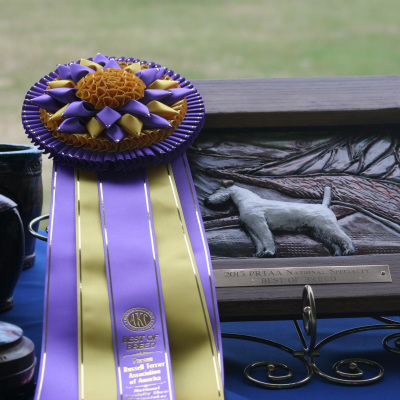 Learn about the awards given for excellence in conformation, versatility and breeding as well as recognition of superior member service and sportsmanship.